1) Open the designed file of Mac system. First two points remain same as above. Go to ‘View’ link at the top > click on ‘Proof Setup’ > Select ‘Macintosh RGB’ or ‘Monitor RGB’ as per your need. 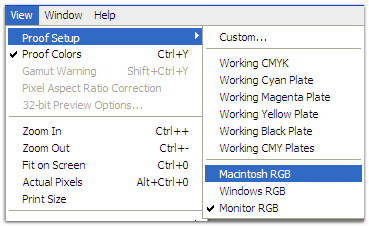 If needed you can change to the earlier Windows Color Profile settings if you are working on a different file. 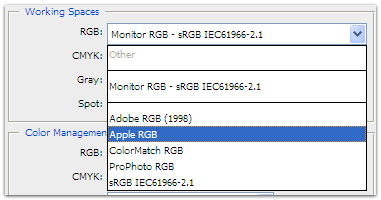 Ok why don’t OSX users change their Apple RGB to Windows RGB ? I’m curious … if you get a high quality calibrated monitor, design something on a pc using photoshop, and then display it on a mac … what will you see exactly ? Richer colors ? If so, I’d say the mac has the wrong color profile. I know someone who can take lots of advantage of it. Thanks for the help…really informative post. dont be so closed minded, the reproduction of color is just as good between both, i own both. But right now the photoshop job i did on my pc was saved on sRGB, looks great, but when ran on my mac on the same monitor it looks washed out.